Florence, birthplace of the Renaissance, is Italy's city of art and culture par excellence, while its magnificent and mighty architecture stands testament to its glorious past. 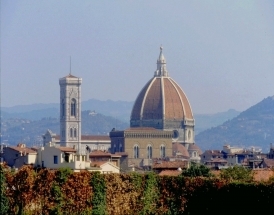 Monumental churches, like the Duomo and the church of Santa Croce, and museums like the famous Uffizi Gallery, house masterpieces of the Italian greats, such as Michelangelo, Da Vinci, Botticelli, Fra Angelico, and even Brunelleschi. The relaxed Tuscan way of life permeates Florence with the Boboli Gardens, a veritable showcase of greenery, the romantic Arno River, and the Ponte Vecchio that glows at sundown and whose lights dance on the water at night. To truly experience Florence, you have to live like the locals do in Santa Croce, the downtown district that never sleeps. Conversely, on the Arno’s left bank and surrounded by lush hills, the quiet Oltrarno district discloses a small-town quaintness with its winding streets and workshops where local artisans carry on the skills acquired over centuries of working with wood, iron, leather, jewellery, and fabric. Florence is also synonymous with elegance and refinement—elegance in the beautiful, high end, ready-to-wear shoe stores, a highly developed sector in this city; and refinement in the local food and wine. Chianti classicos and Montalcinos are best enjoyed in moderation and yet with utmost pleasure at one of Florence's many wine bars and trattoria. Apartment featuring a beautiful terrace in the heart of the Florence historic center. Apartment with a mezzanine featuring a beautiful terrace in the heart of the Florence historic center. Nice and cosy apartment on 2 levels, featuring 2 beautiful terraces, located off the town centre in a quiet and residential neighbourhood.